Ion engines are a form of electric propulsion and work by accelerating a beam of positively charged particles (or ions) away from the spacecraft using an electric field. ESA used electric propulsion on its Moon mission, SMART-1 which impacted into the Moon on 2nd September 2006. The new engine is over ten times more fuel efficient than the one used on SMART-1. Using a similar amount of propellant as SMART-1, with the right power supply, a future spacecraft using our new engine design wouldn’t just reach the Moon, it would be able to leave the Solar System entirely. 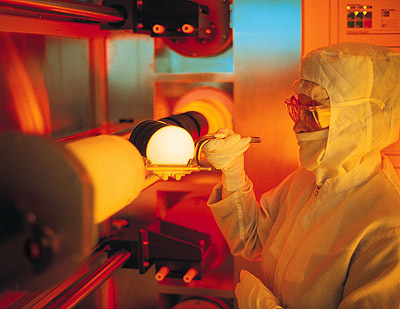 Traditional ion engines use three closely separated perforated grids containing thousands of millimetre-sized holes attached to a chamber containing a reservoir of the charged particles. The first grid has thousands of volts applied, and the second grid operates at low voltage. The voltage difference over the gap between the two grids creates an electric field that acts to simultaneously extract and accelerate the ions out of the chamber and into space in a single step. The higher the voltage difference, the faster the ions are expelled and the greater the fuel efficiency of the thruster. However, at higher voltage differences approaching five thousand volts (5kV), some of the ions collide with the second grid as they are accelerated, thus eroding and damaging the grid and thereby limiting its lifetime in space. The DS4G ion engine utilises a different concept first proposed in 2001 by David Fearn, a pioneer of ion propulsion in the UK, which solves this limitation by performing a two-stage process to decouple the extraction and acceleration of ions using four grids. In the first stage, the first two grids are closely spaced and both are operated at very high voltage and a low voltage difference between the two (3 kV) enables the ions to be safely extracted from the chamber without hitting the grids. Then, in the second stage, two more grids are positioned at a greater distance ‘downstream’ and operated at low voltages. The high voltage difference between the two pairs of grids powerfully accelerates the extracted ions. The test model achieved voltage differences as high as 30kV and produced an ion exhaust plume that travelled at 210,000 m/s, over four times faster than state-of-the-art ion engine designs achieve. This makes it four times more fuel efficient, and also enables an engine design which is many times more compact than present thrusters, allowing the design to be scaled up in size to operate at high power and thrust. Due to the very high acceleration, the ion exhaust plume was very narrow, diverging by only 3 degrees, which is five times narrower than present systems. 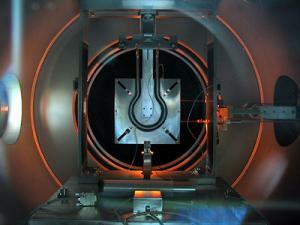 This reduces the fuel needed to correct the orientation of spacecraft from small uncertainties in the thrust direction. There is of course still a great deal of work to be done before the new engine design can fly in space. “Working with our industrial partners, the next challenge is to transition this promising new engine design from laboratory experiment to spacecraft flight model and properly define the new missions that it will enable”, says José Gonzalez del Amo, Head of Electric Propulsion at ESA. The flight-suitable engines must then be tested: and for ion engines this is a long process. Since they must operate continuously in space for tens of thousands of hours providing a small thrust, ground tests in a vacuum facility must last several thousand hours to prove their reliability. Only after all this could the first flight models be launched. Once ready, these engines will be able to propel spacecraft to the outermost planets, the newly discovered planetoids beyond Pluto and even further, into the unknown realm of interstellar space beyond the Solar System. Closer to home, these supercharged ion engines could figure prominently in the human exploration of space. With an adequate supply of electrical power, a small cluster of larger, high power versions of the new engine design would provide enough thrust to propel a crewed spacecraft to Mars and back. “This is an ultra-ion engine. It has exceeded the current crop by many times and opens up a whole new frontier of exploration possibilities,” says Dr Walker. 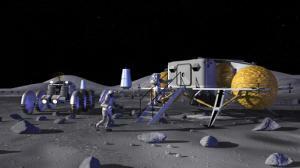 NASA To Build Lunar Base - Why The Moon? A new initiative to increase interaction between ESA, European universities, research institutes & industry has just begun. Through its Networking/Partnering Initiative, ESA is offering to support research carried out by institutes & universities in advanced technologies with space applications. Technologies developed for space often have significant spin-offs for non-space applications and some of the very advanced technologies developed by universities & research institutes, for use in industrial or domestic applications, have potential ‘spin-in’ for use in space.